We survived Winter Storm Juno – a.k.a. The Blizzard of 2015 – unscathed (in 2012 The Weather Channel [TWC] started coining names for winter storms, a la NWS’ hurricane names). It was fairly unimpressive in Woburn. There was a lot of wind, so therefore a lot of drifting, which makes measuring and quoting snowfall amounts a bit of a mystery to me. We had a chest-deep drift on the driveway (what’s that, 4 feet? ), and ~20 feet away in front of the garage doors the pavement was showing, so yes, there was a lot of wind. I’m guessing Woburn probably got about two feet, but I didn’t poke a yardstick in the snow anywhere, I’m making a wild-arse guess. NWS measurements in the area span from 36 inches in Lunenburg and Auburn (mid-state) to 33.5 inches (POINT-FIVE accuracy??) 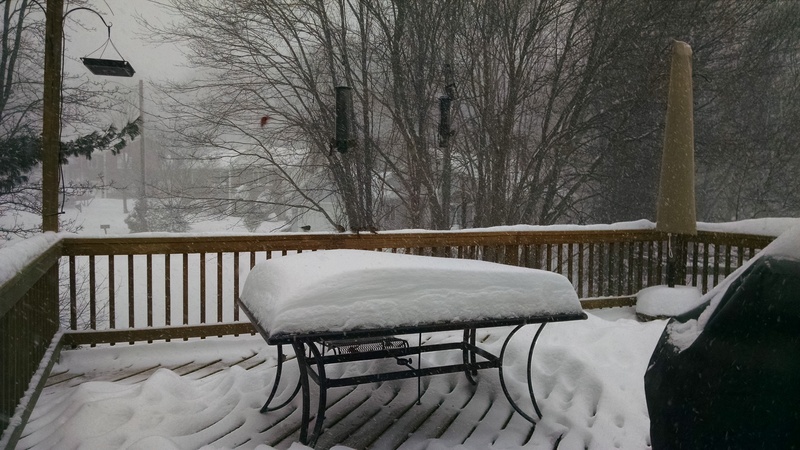 closer by in Framingham, and 24.6 inches (POINT-SIX????) at Logan Airport for the official Boston measurement, making Juno the 6th-heaviest snowfall from a single storm on record. The photo on the right (click on it for a larger version) was taken about 7:30 am EST Tuesday morning, 8 hours into the storm with another 12 hours to go. Parts of the deck are bare, and parts have 2 foot drifts. The dark red blob in the photo to the left of the bird feeder is a male cardinal trying to land on the feeder, having a little trouble. Woburn was plowing our street with 3 plows in formation like they do on the highway – first one (a pickup truck) down the center of the street, second one (a small dump truck) a little to the right, and the third one (a full-size dump truck with a full load of sand) pushing the plow-ridges to the side of the road. They did a good job. I went out to the garage the night before and fired up the generator to make sure it would start if we needed it. We didn’t. And after all that, we didn’t lose power once, which is more than we can say about the Cape and the Islands. We also had two 5-gallon jerry cans of gas and our orange monster that sleeps in the garage at the ready, so we were prepared. Maine got hit marginally less, with 27.4 inches in Portland, 24 inches in Wells, and 22.4 inches in Grey. The power grid in Newcastle (where the Ballot Box is) has been more fragile in the past, but we didn’t lose Ballot Box power during the storm at all, even though there were strong winds and over a foot of snow up there too. This entry was posted in Current Events, Winter. Bookmark the permalink.